WebPT is an EMR solution for physical therapists that allows you to create documentation with integrated scheduling, practice management and more. I like that WebPT prevents me from making mistakes (like forgetting Gcodes or billing errors) and that it's customizable. I mostly use the "additional comments" boxes to document, which makes it quick and easy to document the information I feel is most apt. I use SFMA as my evaluation, which gathers information differently than your typical PT exam, and can place all of this in the additional comments box and only that information carries through to the eval sent to the MD. Also, your customer support is FABULOUS. I wish there was an easier way to view previous notes. I'd like to be able to see all my previous notes as tabs, and be able to click on one and quickly view what I've done previously for reference (like tabs in Xcel or something). I recently switched jobs to a clinic that doesn't use WebPT, but they are planning to implement it soon. My documentation time is so much faster - I can document during sessions quickly and easily without sacrificing patient care. "WebPT offers a 'real help' to therapists in need"
"Helpful tool for a busy clinic." WebPT makes scheduling super simple with a user friendly approach. Need to change the layout of the calendar? No problem? Need to add a PT? No problem? Need to change a persons appointment? Easy. Between the two clinics we have, the patients are not shared automatically and you have to go in and manually add both clinics to the patient. It has caused problems before where we search for a patient at one clinic and they don't show up until you search the other clinics base. It would be great if it patients were added to a “database” for the company as a whole instead of individual clinics. It can be pricey because you have to pay per license you have for each PT and clerical position. We just have 3 PT licenses and activate/deactivate PTs for the day that they work. It allows you to add everything you need to. Patients chart. Co-pays/deductibles, insurance info, billing information, permitted visits for the patient, how many patients, all of the progress notes, everything. It’s like having instant access to everything for and about the patient right there. What Physical Therapy solution do you use? The ease of use, it is very user friendly! We have our insurance sorted by colors and this is one of my favorite features to be able to know what insurance a patient has based on the color of their appointment without having to go to their chart and look it up. It is very convenient to have access to all of the patients records and be able to access it by their name on the schedule. They only thing that I dislike about WebPT is that they do not have an app for tablets or phones. Many of our therapist use tablets while treating patients or use their phones to check their schedule while working in schools and it would be a nice option for them to have. It has really benefited our clinic in being able to keep medical records, patient information, visits and orders in one place. Scheduling and keeping up with medical records all in one place. "WebPT has streamlined so many task in our PT, OT & ST outpatient clinic!" The ease of use in WebPT is nice that the work flows from one task to the next so naturally. If you leave something out, you are usually prompted to go back and fill it in making almost impossible to mess anything up. On Medicare, if you forget to do your ten day progress note you can not go forward without doing it. All the checks and balances are there for the hurried therapist that can so easily get in a hurry and simply forget one simple detail. With WebPT, it pretty much reminds you of the little details that make big differences in compliance. It would be nice if there were more follow ups on signature other than just Medicare, after all, they are all required. I would like to see reports for all missing signatures. Also, I would like to see a report for expired POC's other that Medicare. Just Saying! you should give it a try. We did and have been pleased! The Schedule has been great for a clinic the size of ours. We have two PT's, two PTA's in clinic, Three OT's and two OTA's in clinic along with two full time SLP's and one part time SLP not to mention several others that work only in the schools. With WepPT's Schedule you can color coordinate the insurance companies according to the therapist that are credentialed to treat each insurance company. Aslo, this schedule makes it so so easy to schedule a patient to be treated by all three disciplines. Its a real time saver!!! "WebPT has been a game changer for our outpatient private practice!" WebPT is an amazing EMR platform. The company is innovative and a leading force in physical therapy. In addition to EMR, they are outstanding with educating their members (through frequent Blogs and Webinars) on every aspect of physical therapy regulations, changes, and best practices. WebPT is dedicated to giving back and is highly involved with the APTA and a major contributor to the APTA PAC that helps all of us. Most importantly, their customer service is terrific which is paramount when having any EMR issue. I would give WebPT this highest recommendation. The biggest issue with my WebPT experience was the recommendation to use Kareo billing. However, we are preparing to change to Therabill who WebPT acquired approximately 1 year ago. I'm not looking forward to the change of systems and extra expense to do so, but hopefully in the long run will pay off. We just started with the Outcomes portion of WebPT so I'm hoping this will be a valuable asset - I do feel that the pricing may be a little high for the outcome portion. WebPT has made my entire practice more efficient and helped us increase productivity. This ultimately affects our bottom line and increases our profits. I like so many things, but especially the format of the daily notes and evaluations. It is easy to navigate through the pages, only input necessary information, It cut my documentation time in half thus improved my overall productivity. As an administrator, I absolutely love the scheduling component and reporting section. Billing is quick and simple, missed reports are easy to generate, and productivity reports are easily generated. Anytime I have had a question, which is many, the customer support team has been very helpful! I can't imagine a life without WebPT. As a pediatric based clinic, some improvements and updates are needed for the most up to date evaluation tools. In scheduling, I would like to see a component where you can cancel clients for a time period collectively rather than having to go in and individually canceling each one (i.e. holidays). I researched multiple EHR companies before deciding to subscribe to WebPT for our pediatric company. We are therapy based and this is the BEST therapy (OT, PT, and Speech) EHR that I reviewed, and the most cost effective for our non-profit. WebPT has improved my overall productivity. I am able to quickly see any missed notes. It also enables therapist to more thoroughly supervise assistants with the documentation process. WebPT has also streamlined our billing procedures. "Best software for start up but lacks research based personalization"
I really like several aspects of other software which simply are not available in WebPT. I would like to have all the CPR as a cluster objective measure. I would like the ability to create objective measures that are not currently in the software and have the reason behind the test autopopulate such as 6 min walk test Pt score, goal score. score below ___increases fall risk. Call and take it for a test drive. The biggest part of what may sway you is how the medical billing works with WebPT. Overall I do think that WebPT is one of the better platforms out there until you get into 10+ clinicians. Then it is actually more expensive when you look at the reports that you can run in other softwares such as Clinicient. I have used Rain Tree in the past and kind of liked that one but at the time it had too many free text boxes for my liking. I felt like i had to fill them all out. I probably liked TherapySource the best out of all commercially available softwares I have used just for ease. "Love WebPT and would highly recommend it to my friends!" Love that I can log on from anywhere to do my notes. I love having the convenience of being able to do my notes from the comfort of my own couch or coffee shop, especially since I don't want to spend any more time in the clinic than I have to! Also love WebPT's staff--they are always so friendly and accommodating! Sometimes completing notes can feel like a never-ending task, since WebPT can ultimately go on infinitely. Wish there were "best practice" guides for with PT notes, evaluations, and progress notes. It's super easy to schedule patients and to know my general workflow before I come in for the day. I love being prepared for my patients, and love the ease of access of checking another patient's notes if I'm seeing them for the first time and don't know them personally. The scheduler has 15 minute increment grey marks that are very faint and I wish there was a way to make them darker. Also sometimes their updates are inconvenient. We use WebPT has our EMR system in a physical therapy clinic and it is wonderful to have a way for everyone in the clinic to be on the same page information wise on every patient. Thank you for the feedback, Alysha! We are glad you like the reports, and we also have an enhanced reporting platform, Analytics, rolling out to all of our Members soon, that will provide you with rich, real-time business intelligence to help you make better business decisions. Thank you for being part of the WebPT Community! This software really saves the therapist a lot of time! It allows for creating and managing patient schedules, cancellations, as well as reimbursements and effective documentation. The main drawback is that customizing exercise sheets for patients takes some time. Also the price is a little bit on the expensive side. I would recommend this software for anyone in the physical therapy field. It really makes a lot of things easier and although it is a bit pricey it is well worth the cost because it cuts down on paperwork and improves efficiency and productivity all around! Plus less paperwork means more time spend improving the patient's quality of care! The best part is that it is through a cloud service so everything can be updated in real time! Also it allows for creating outcome reports to track diagnosis and tests utilized. "Easy, Quick and Efficient! " I like how easy to use WebPT it. As an assistant at a medium sized physical therapy firm, WebPT made my job easier by allowing me to create appoints, send reminders, and attach medical charts to client cases all in one easy system. It eliminates the need to buy additional programs as everything can be found in one easy to use database. Some functions of the program are clunky and the program could have better navigations internally. With WebPT, we are able to schedule appointments, edit them incase of schedule changes and manage patients for multiple therapists through one database. It also allows you to view a comprehensive calendar with everyone's schedule. We use WebPT for our private practice. It is extremely user friendly, is great for billing, and makes it almost impossible to make a mistake on a note. The checks and balances wither the federal payers is outstanding. The one improvement that I would like to see is being able to go back and forth between screens easier with notes open. For example, if a patient script is in their edoc, and I am doing their initial evaluation and I want to look at the IC D10 code from the script, I have to save the IE, and go into edocs. Takes time. Our billing and notes are more accurate, efficient, and timely. If another therapist is treating your patient, they can just read your notes. Scheduling for multiple providers, paperless, electronic medical records, quickly upload documentation for patient chart; ex. insurance cards, medication list, referral, etc. Missed notes report, lost patient report, productivity report. The Billing program is not on the same platform- however this will be available in the near future. Highly recommend!!! From the Start customer support has and will be available and willing to help through the entire process and beyond. Very happy with this product and the company. No longer have missed notes from therapist. Medicare cap report calculates used/ remaining amount of therapy cap. Keeps track of presciption and alerts prior to expiration date. WebPT keeps me abreast of the current guidelines of the healthcare landscape and provides a great marketplace to search for clinic equipment. Documentation form is longer than I usually like to send to physicians. The formatting of the daily notes and plan of care leaves an empty space with the following lines on a second page which makes the POC 2 pages when it could easily fit on one page. Navigation is somewhat easy in the beginning. Once you make your templates then the learning curve is exponential and seamless. Worry free documentation and documentation timing is improving but still longer than I would like. Using an EMR online allows me to work from multiple locations, thereby giving me flexibility of my schedule. I really like the fact that I can help to cut back on our cancellations and no-shows. I am able to send our patients an appointment reminder either through a text, an email, or by phone. I have come across a few glitches when I have tried to upload external patient documents, such as our physician referrals and other documentation. Being able to creat and view schedules for patients, therapists, equipment, or treatment rooms anywhere, anytime has been the biggest benefit. We always struggled with this in the past and to be able to do it so easily is a huge benefit. "I enjoy using Webpt. I handle the scheduling and entering patient information into the system." The system is easy to use. Doesn’t take too long to enter patient information and get them in the system. It seems like webpt goes down a lot which freezes us out of the system. They are really good about notifying us as soon as it’s backup. It allows us to document in one systems for both the from desk and the providers. Its connectivity of registration and patient demographic information is very convenient and integrates well with therapist notes and documentation. External documents needed to be physically scanned into the server and couldn't be directly uploaded. Admittedly this may have been shortcomings from my clinic, it have have been possible to directly upload digital documents, but based on how our clinic was handling WebPT, this was my perception and how my workflow was handled. Also, whenever the internet signal was lost, our work was never saved if it was in process, and couldn't be restored if it wasn't saved. Hold times for customer service or for tech support were always at least an hour long, and often twice as long. Connectivity, occasionally there were server-side connectivity issues. I like the fact that I can go to a certain date of service and see all of the appointments at once. This allows me to go through all documentation for a particular day one patient at a time without having to do a bunch of typing. Just have to hover the mouse over the patient and click the hyper link. I would recommend WebPT to other providers. Not only does it meet our needs as a practice, but it also has available learning webinars and blogs that are up to date on current changes in the healthcare industry that directly effect outpatient rehabilitation. Currently, I am not experiencing any business problems. "Don't waste your time with any other EMR company and start off right with WebPT or switch now!" System is never down like other EMR companies and navigating through the software is simple and easy to use for all ages for Providers. Nothing I dislike about this software after dealing with multiple other EMR's. Do not waste your time starting with other EMR companies. It is a pain to switch EMR's when you already have an established clinic with patient charts. WebPT might cost a little more than others and established clinics and new clinics are always trying to save money where they can. The less expensive software's always seem like a good idea and Providers think they can deal with less features in order to save in overhead cost, but it is worth the extra money to save time and be less stressed. What is nice about all the features WebPT offers is you do not have to sign up for all of them right away and can add them down the road as your business grows and you realize you need them to be more efficient. As a billing specialist who deals with multiple EMR companies for my clients I cannot express enough to the multiple perks of having WebPT. Access to patient payments are quick and easy in the system to enter or to look up. Scanning software is clear and fast. Authorizations are the hardest part of PT/OT to keep track of and can be accidently missed. Other EMR companies offer tracking for authorizations, but you have to be in the patients chart to see the expirations. WebPT shows in Red when authorizations are expired and makes it very clear on appointment how many are remaining so that both clerical and the Providers can see this immediately when the patient checks in and helps avoid missing auths. Webinars are offered when any new important updates in PT/OT occur to keep all Providers in the loop and no extra fees. "Great program for PT's !!" I love the easiness of the program, scheduling, posting payments, and appts reminders. How easy is to access scheduling from our ipad, Iphone, computer. The way we can select the therapist individually or the team. I wish the appt upcoming appts can be printed by the time frame we need. I wish the posting payments can also be selected per the time frame we need when sending a receipt. txt confirmation to be linked to our email - or part of the txt to say do not reply to this number and contact the office. WE have lots many appts late cancels or no show because they reply to the txt . Total amount vs a week worth would help us ease invoices. If patients has two cases open - for the drop down menu to show this. It would help with proper scheduling. Wish the money sign can show on the DOS service even thought date of transaction is different. That way we know is paid and on the date it was paid. currently is doesn't show it and it drives me crazy. Faxing - it would be easier if you can select the documents by a click a box - many of my patients have 220 documents and the individual upload EATS 45 minutes of my time. compared to other programs I have worked with - WebPT is awesome! But their is always room for improvement - mainly in the administration side. My PT's are pretty happy with the system and customer service when we call for help. What I like best is the ease of the entire system. The documentation is standardized but you can custom sections if you prefer that, the patient intake is easy to use, scheduling is a piece of cake, the ongoing education is superb, the knowledge of policy and procedural changes is impeccable, their customer service team could not be nicer or smarter or more flexible...I could go on and on. We love WebPT! There is so little to dislike. There are some recommendations that I think need to be addressed but they are very minute compared to the competition out there. The only thing I would share here is I am unhappy with the use of the product on touch screen devices like iPad's and iPhone's. Since switching over to WebPT's EMR system from paper years ago, our business has continued to grow do to the ease of scheduling, documentation ease and because we are feeling confident we aren't missing any updates in state and federal law changes, etc. "Easy to use-prevents errors in billing!" I love the template of WebPT. It's an easy-to-use format with built in options, as well as additional room for more written information that you might need to add. It continuously updates and provides emails with new information. I like the reminders that it provides regarding Medicare caps and when progress notes are necessary, etc. It had additional features like text or email reminders for patients. I have used several other online mediums for documentation and WebPT is definitely my preference as a PT. If you question a certain special test or questionnaire, WebPT also has built-in subject headers that provide you with more information. I like being able to access from home when I am unable to complete electronic documentation in the clinic (I do write everything down, and document as I work, but try to stay 1:1 with patients as much as possible). As silly as it sounds, I dislike checking all of the buttons. :) I wish there was an easier way to go through some of the subjective portion, but you can write in additional information if you wish to save time. Also, you must refresh between multiple users often so the calendar updates. If multiple members within the clinic are using WebPT, you have to be careful not to double book, etc. WebPT makes it easy to fax progress notes and evaluations to insurance companies (worker's compensation), lawyer's offices, doctor's offices, etc. This saves a lot of time and keeps a written, easily accessible record of contact history. It also stores information about insurance and makes it easy to collect copayments and monitor Medicare caps. Our office has been using WebPT for 3 years now. I really like how easy WebPT is to use for documentation. I also appreciate the efforts WebPT puts in to educate staff and keep their service compliant with changing healthcare guidelines. WebPT had a great team to help implement the software and coordinate with our billing service. Another team helped our staff learn to use the program. Top notch work from both of these teams! Any questions regarding the few issues that have come up in the past 3 years have been resolved quickly. I have also had several new hires that came on board with our company due to how well they liked WebPT from previous experiences. I have found some discrepancies in the numbers that the new analytics program gives me compared to reports that are available in the main WebPT platform. This is likely an operator error on my part. The other thing I would like to see is an improved exercise flowsheet that is easy to see progression of each exercise over time, and ability to mark which exercises are part of the current HEP. Go for it! Great company to work with and continues to make great upgrades to the program. Our small PT practice has seen improvements in our productivity with WebPT overall. We also have noted much better compliance with medicare guidelines then the previous EMR that we used. "Easy software to operate and learn"
I like the ease and functionality of the software the best. The schedule is great and easy to manipulate. Dislike that the boxes on the assessment tab are so small. I like to write a lot of information under each goal in case another therapist needs to see one of my kiddos that day. Easy scheduling and to know where everyone is located that day. "WebPT * Performance Driven Software for Physical Therapy"
WebPT is extremely user friendly, in all respects. Their customer service is second to none! Always friendly and always willing to help you immediately. The software itself ensures that our therapists are compliant not only with Medicare but all insurances as well. The software allows us to keep tabs on those physicians that refer to us, production and many other important reports. Not only do the therapist like the software but so does our office manager! The ease of scheduling is optimum.We love our Webpt and have for over 8 years! I honestly cannot say there is one thing that I dislike about WebPT. Benefits include the monthly webinars that are available to our entire staff. Education is extremely important and the webinars allow us to stay on top of critical changes in our physical therapy world! There are some features that are missing that have been suggested in the forum that appear to have been ignored. Growth takes time and WebPT is growing and attempts to remain compliant with the changing world of insurance. Solved our move to EHR. Reporting is easier and less manual intensive. Scheduling is easier. Chart review is easier. Faxing is less complex. Organization of paperwork is less work. WebPT integrates all the elements that we have to address in PT documentation. They address Medicare requirements such as FLR and the now completed PQRS, assist us in making sure we are only using codes that are billable (ICD-9 & ICD-10 are supported as needed) and even help with new CPT codes when implemented. They flow seamlessly with our billing vendor and make electronic billing much easier. They keep our documents so we can access from any computer, and don't have to continually add storage to our computers. They are a leading producer of educational webinars for the PT industry as well. They are working to keep up with the growth of their business so response times to support requests are a tad slower - but still usually less than 24 hours. I wish there was the functionality of a pop up alert when certain pages open so we can alert other users to critical info. I feel that WebPT has us covered! They help us ensure that we are doing things the best way possible. "Just What a PT Clinic Needs! " I like the look and color scheme chosen for the software, hey its important! The schedule is easy to read and easy to make changes to appointments; maybe too easy. I like that each individual has their own password to protect confidentiality for medical documents but syncs what we need for all stations. It allows to save patient information very easily, create new patients, and make new appointments. Referencing my above comment, moving appointments and changing them is way to easy, if you accidentally click them they can be deleted or moved and sometimes you don' t realize until its to late! It takes a lot of clicking back and forth to create a schedule/print. You have to go to one window to select which PTs are there that day, which order, which times you want first or last. I think it requires to many steps and would be helpful for it to be a little more streamlined. When loading and saving medical documents it sometimes crashes and you have to hope to remember what the patient said and their chief complaints. There is just a few glitches that could be easily fixed. Make sure you have a good internet connection! Our building had horrible service and it would cause the system to crash constantly. Its not worth the loss of information and the time to input everything in manually if you have to take notes! This allows PT's to document during their evaluations and have multiple computers for potential use. It is helpful that each individual gets their very own login to keep confidentiality. It is great to have the program on each computer and have it online instead of downloaded on the computers. It makes it easier for employees to complete work at home and keep their patients updated quickly. Having them sync helps the workflow and to keep the practice going without any delays. That they are educated on changes in the industry and I can trust in them having my chats up to date and educating me as well. Sometimes hard to get a phone call in to them. They put in new codes, PQRS and all required things so I will get reimbursed without rejection when billing. Notes are certainly more legible. It keeps track of so many different things to help with MC requirements, etc.. Keeps me doing what I love best, treating patients. Difficult to learn and adapt to after doing paper charts. It is great especially now that Therabill will seamlessly interact with it for a smoother billing process. MC reporting requirements. Better documentation. "Positively effective, and easy to use "
I have used other electronic documentation programs, and I have found that WebPT is the most detailed and user friendly. One of the things I like best about WebPT is that it has a "neat" template which makes it easy to use and navigate. This is important because the work day can be extremely busy, and having a documentation system that allows for efficiency is key. Furthermore, I am constantly impressed with how often WebPT emails its' users about current updates, and system downtimes. This just shows their commitment to such a great product which in turn allows us, as clinicians, to keep utilizing it with immense satisfaction. 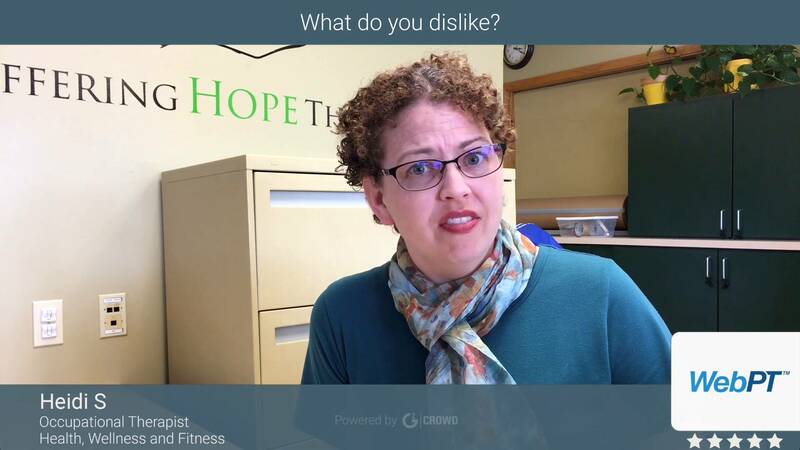 I have no complaints/dislikes currently with WebPT. WebPT is a great program in so many ways. It's very user friendly and the Customer Service is amazing! There are still some things that are being worked on and added every day....not that i dislike it, i'm just anxious to try the new things and have short patience for the development process. haha. I want the new features now! i know they'll be great when they come out though. It's a great program and easy to use for everyone. It helps our front office keep the back office on task with missed notes, progress notes, and incomplete documents way better than our old outdated program. Thank you for the feedback and for being part of the WebPT Community. We love innovating and can't wait to keep showing that to you in our regular releases! "WebPT is a provides huge benefits for managing a PT practice and the cost is very reasonable." I find access to patient records from anywhere there is internet available to be very freeing. There is no more keeping track of paper charts and I am not bound to the office where the charts are to complete details. The integration with Therabiill is also very helpful; this streamlines one of the least fun, but most essential parts of the job. Community connection and support with professional issues like coding and billing is very beneficial. Having experts in this area, is wonderful and saves a lot of time researching necessary information to make a private practice function. WebPT takes away the isolation that a sole PT can feel when operating in today's environment with changing Medicare rules, diagnosis and billing codes, personnel requirements, and other administrative issues. WebPT offers expert assistance and saves at least one administrative staff position. The administrative segments of your software are easily transferrable from one staff member to another. This EDI software had really streamlined my practice and improved patient care by organizing the working parts of PT that are essential to making a viable and effective private practice. Your support staff is available and responsive. The fees are also reasonable in that there is no big upfront cost and the monthly fees are affordable; Internet access has allowed me to get rid of one computer, not have as much storage in the office, and eliminated the need for IT support and expense related to hiring consultants for troubleshooting and fixing IT problems. I am frustrated when the site is down for maintenance, though your alerts are helpful and I am made aware of the scheduled maintenance. WebPT is politically responsible to the needs of private practice PTs thorugh financial contributions to APTA PAC. Administrative problems and losses with scheduling, no show appointments, and front disk efficiency are greatly improved and presents an organized and professional first line to patients. I am increasing the bottom line with less hassle, happier staff, and less expense. I love that I can access all of my documentation on the go and am not stuck at the office working on documentation. I also love that I can scan and upload all of the patient documents to their file and do not have to keep much paper. I find that the exercise flowsheet is cumbersome and difficult to manage, so I use paper flowsheets and upload them to the file at discharge. I love having my documentation tied into my billing. The charges are automatically submitted to my integrated billing co. As a small practice owner, it is a vital problem that has been solved and saves me a ton of time. "Fantastic, incredible and the best EMR for PTs." From the demo, our experience has been positive, supportive, and spot on for our practice needs. Every conversation we have had with WebPT has been incredible, from support to sales. Ease of clinical use, depth of front desk interaction/information and the ability to satisfy the needs of the back office and management. When we were researching EMRs (we demo'd 15) we were looking for a program that would be easy to use for our clinical staff, front desk, and management - we found all those abilities with WebPT. One issue we are faced with daily is the inability to easily identify when copays did not go to our integrated billing software. If a clinician finalizes a note, before the front desk can obtain the copay, WebPT annotates the copay but does not "red flag" the transaction as an unsuccessful transmission. I would also set up the capability of management to create spreadsheets and data mine needed information. Use it - you will not regret it. It is worth the initial investment and monthly expenses. Did I also mention it is incredibly easy to learn and use? As for the business problems solved - the ability to accurate document our patient's recovery with all the necessary outcome measures and then transmit that data to our integrated billing for insurance processing and payment has made us successful. Technology is working for us instead of against us. The benefits range from faster time documenting to accurate billing. The program is easy to use and flexible for a variety of styles of practice. It was very helpful with compliance for Medicare. Within text boxes there is not auto- spell correct. We also can't delete former users from the message feature which is really annoying as our practice changes. WebPT is committed to staying current both technologically and with issues facing PT's such as compliance and trends in healthcare. There are some functional issues that are problematic, primarily, lack of auto correct in text boxes that require narrative like the patient history. It integrates well with our billing service's software and we are able to use it to communicate well among our staff members and to our billing service that is off site. We are staying compliant with Medicare. We have good data on employee productivity and physician referrals. It allows us to update data easily so we can watch trends in our practice and referral patterns. I love the schedule! You can program the colors on each insurance or event so it's easy to differentiate! I also like that they send an email reminder automatically to the patients that are on the schedule! My favorite thing about webpt is, the dashboard that gives me a summary of what insurance pays by each patient's name that way I know how much to take at the time of the appointment without looking up their chart. I really don't have anything that I don't like! There are many benefits with this program, but being able to take payments that roll over to our billing is probably the best. "A good EMR for any practice"
Web based functionality and frequent updates to stay on top of Medicare changes. The interface can be a bit overwhelming with drop downs, but you can customize to use more text boxes, if you prefer. Use it. It does what you need and doesn't cost too much. It relatively easy to learn and use. Obviously, I feel every PT practice needs an EMR. WebPT solves that issue and makes it affordable. I like how the cloud based system gives you access to the program wherever you are. I usually work remotely, so it is helpful not having to carry around a whole bunch of papers. I used to document on paper, but then realized that I was a much faster typer. WebPT's templates are very easy to use and very helpful in keeping things in a neat and orderly way. I have utilized 2 other platforms in the healthcare field and so far WebPT is far superior. I work in the scheduling, insurance and administration side and the capabilities are far more efficient. In addition, WebPT is responsive and helpful. Another thing I have noticed is that the system does not go "down" for "updates" like other healthcare software I have used in the past. So far I have not found anything I dislike. I like the tracking segment of WebPT. There are "fail safes" for authorization and prescription tracking which is paramount to ensure the patients coming in are authorized for treatment. I like the easy-to-follow format, personalization options, and professional look. Everything is Medicare-compliant, which saves me time in fighting denials. I'd like to personalize it even more. I wish I could add or change fields for my specialty, Speech-Language Pathology. I rarely receive denials from insurance. When I do, I provide documentation from WebPT that results in a reversal due to the thoroughness and professionalism of the documentation. The scheduling system is easily navigated. Reminder phone calls, texts, or emails go out to every patient, resulting in a low no-show rate. "Use of WebPT in Physical Therapy Office"
The system is very user friendly and allows for the mainstreaming of the office. My favorite feature of this software is the ability to have the medical record in the same system with the schedule. The EMR feature of this software is excellent. This software is very buggy. We experienced lots of freezes and glitches in the beginning of using this software. Over time it improved but we were left with dropped service and office standstills several times because of these issues. This solved our issue of using three separate systems for EMR, billing, and scheduling into using only one software. Pretty user friendly and the flow of the site makes sense- it is easy to click through for a daily note. Also, the waitlist feature is really nice. When I do my billing reports for my billing person, the date of injury does not come on the report for commercial patients. Also with Medicare clients, date of injury, date last seen, doctors name and NPI also do not appear on my billing reports. It takes me a couple of hours to get my billing ready for my biller to do. Not having to solve any business problems . "Easy and accessible software for physical therapists"
I enjoy the accessibility of WebPT allowing me to use it through any computer with internet access. I like that it allows documentation of functional evaluation tools such as the Selective Functional Movement Assessment. There is a lot of boxes and clicking involved with the software but it has everything you need as a physical therapist. Most software programs involve a lot of clicking but WebPT allows you to bypass unneeded information. It is nice to be able to have all patient information on one site and access it through all internet connections. "great to be all digital"
ability to keep all notes digitally and access all records, even across disciplines in our clinic. poor universal accessibility- tab key doesn't always progress to the next field. Date of last eval/progress note is not on the front page of patient record. Fields are too small, especially assessment field. Spell check doesn't work in all fields. Need to be able to run a report to see how many billing units are used for each client, so as not to exceed PARS. All records are kept digitally. "Quality documentation program with a few nuiances"
Excellent, intuitive user base. This is the primary documentation system for outpatient facilities which has the advantage in hiring new staff. What is best about the program is the flagging of inconsistencies of time in to time out with billable hours. Excessive drop down menus make searching for content cumbersome for the new students. Difficulty with save as you go data when in less than ideal wi-fi environments. This software would benefit from integrating a suggestion of G-codes corresponding to health description in the initial evaluation. Overall, i have little to dislike, as the product exceeds my expectations. Highly recommend if an outpatient clinic owner. It will improve your bottom line and allow more time of the therapists to spend with patients. Completing medicare guidelines to avoid lost revenue. This software with its shortcuts has saved time and reduced errors from poor penmanship. Also, i have noticed increased quality of documentation (more specificity in evaluative components) in the therapists when we began using this system. "Web PT is an all inclusive program for electronic documentation, scheduling, billing, storing files." As an office manager I rely on this software on a daily basis. From logging into to patient files, pulling billing reports, scheduling patients, coding etc. trouble shoot problems, the response time is within one day to resolve your problem. I really have no negative input at this time. The program is user friendly and all employees can be trained easily for this format. Review all the resources available to your clinic. All inclusive program for Physical Therapist, Office Managers, and Billing. Actually, all of our early concerns were answered and improved by the company. We have no current concerns. Our company couldn't be happier with WebPT's EMR system. I highly recommend it! This program provides fast and efficient, HIPAA compliant documentation which is our biggest concern. The benefits are that all documentation is kept in the same place and that we aren't retrieving charts to do paperwork. It is all in the same place and easy to access. * We monitor all WebPT reviews to prevent fraudulent reviews and keep review quality high. We do not post reviews by company employees or direct competitors. Validated reviews require the user to submit a screenshot of the product containing their user ID, in order to verify a user is an actual user of the product. Hi there! Are you looking to implement a solution like WebPT?